There’s an old saying that when life hands you lemons, make lemonade. In a twist on that adage, Brad and Kat Moore, handed lemons by the Great Recession of 2008, decided to make hot dogs. And doughnuts. 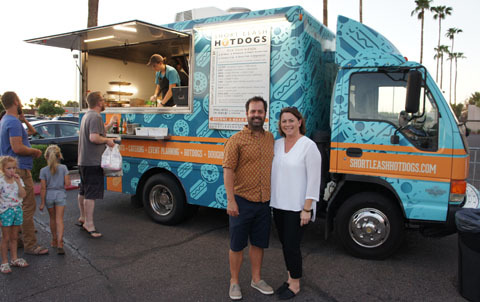 Brad and Kat Moore, the creative team behind the popular Short Leash Hot Dogs food truck, have two brick-and-mortar locations in North Central, one in the Melrose District, and one at the Biltmore Fashion Park (photo by Teri Carnicelli). Really delicious hot dogs—on puffy naan bread, served with a creative array of toppings (think mango chutney with a drizzle of mayo; or chipotle cream cheese with sautéed onion and fried bread-and-butter pickles). And divine brioche doughnuts, from traditional favorites like maple-bacon to spicy Thai coconut and chocolate cake doughnuts topped with peanut butter icing and chocolate covered pretzel crumbles. All this deliciousness is rooted in professional challenges for the husband and wife team. He was in banking, she was an interior designer. When the recession hit, his bank closed, and her employer hit the wall when home construction came to a screeching halt in the state. They decided to take a very different road. “We’ve always been passionate about food, and Kat is an exceptional cook,” Brad says. “When Kat was in college, she wasn’t sure if she wanted to go into culinary or interior design. I talked her out of doing culinary, and here we are, 12 years later, in the food business. Fortunately for the Moores—and for Valley hot dog aficionados—the business took off, and today encompasses three trucks and two restaurants, with a third on the way. “We’ve had amazing community support and have been able to grow,” Brad says. A big reason is the quality of the dogs. All this is packed into puffy naan, Indian-style flatbread. Their first brick-and-mortar restaurant was on Roosevelt Street in downtown Phoenix. After five years they decided a move to 7th Avenue in the Melrose District was a better fit, which was accomplished in late July. They added Rollover Doughnuts next door, eventually combining the two. “It’s in walking distance to our house, and we’ve lived in that neighborhood for 17 years,” Brad says. The Melrose location also was larger, allowing them to offer breakfast, lunch and dinner and weekend brunches. A second location can be found in Biltmore Fashion Square, with a walk-up window and outdoor tables for diners in the Union Shops area. And now the Moores are planning a third restaurant, at the northeast corner of 19th and Northern avenues in the former location of For Love of Chocolate. That is expected to open in mid-December. “One of the reasons we’re so excited about being in the 19North community is that it has a lot of the same characteristics in the surrounding neighborhood as the Melrose location,” Brad points out. Meanwhile, the Moores continue to operate the food trucks that go out three or four times a week, primarily for catering and private functions and corporate events. “We still go out to festivals and street fairs, including second Fridays at 19North,” Brad says. One more note. What are hot dogs without beer? Short Leash at Melrose is located at 4221 N. 7th Ave. (602-795-2193), and Short Leash at the Biltmore is located at 2502 E. Camelback Road (602-795-2193). To learn more about upcoming food truck stops, and to peruse the food and beer menus, visit www.shortleashhotdogs.com. For catering and other events, call 480-620-8479 or e-mail info@shortleashhotdogs.com.